International initiatives to promote landscape restoration such as the Bonn Challenge have inspired countries around the world to assess their potential to restore degraded land and commit financial resources to restoration. 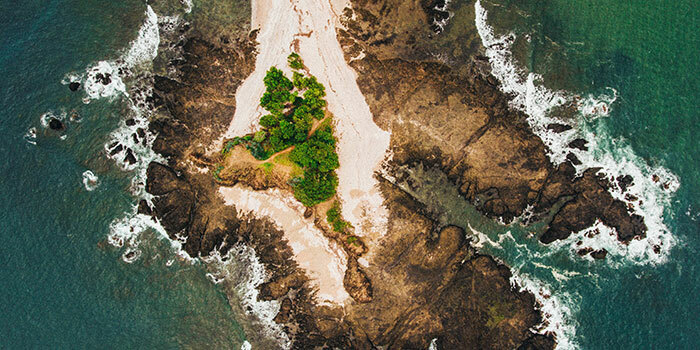 In response to this challenge and government requests to provide better resources for decision-making, the International Union for Conservation of Nature and IonE’s Natural Capital Project formed a partnership around providing such a decision-support tool. Recently, the national government of Costa Rica pledged to restore one million hectares of land with the goals of improving the sustainability of crop and livestock production and enhancing valuable clean water and habitat for biodiversity. Following from the national assessment of restoration opportunity through the Restoration Opportunities Assessment Methodology (ROAM), and tasked with prioritizing where to invest in restoration in Costa Rica, Leander Raes, an economist with IUCN, utilized the partnership with Natural Capital Project for assistance. Leander and his team needed to evaluate the potential benefits of the restoration programs and identify locations where program activities could meet multiple, potentially conflicting, goals. IUCN and NatCap had already been collaborating on a tool to facilitate what’s known as “benefit balancing” – the visualization of where restoration is more or less likely to deliver multiple benefits for ecosystem services like clean water, habitat or agricultural production. The software, called Restoration Opportunities Optimization Tool (ROOT) was developed by NatCapper Peter Hawthorne and first applied in Uganda in partnership with IUCN in 2015. To be useful to Leander for planning restoration in Costa Rica, the tool needed some modifications. After eight months of iteration with IUCN, NatCap launched a new version of ROOT. ROOT now has an easier-to-use interface, is more flexible in how users define objectives and constraints (such as restoration targets or budgets), and allows for targeting activities at higher resolutions. New outputs like “agreement maps” allow the user to readily identify areas where many different objectives overlap. Furthermore, integration of social, economic and demographic data in ROOT means that countries are now better equipped to address impacts of restoration on different populations. In August, outputs from ROOT were presented to the Environmental Vice-Minister of Costa Rica, and will now be presented to representatives of the coffee and livestock sectors. The results demonstrate how restoration actions could be implemented to improve wetlands, maximize habitat connectivity, increase water quality for downstream communities and reduce sediment export in areas of municipal water and hydroelectric production. 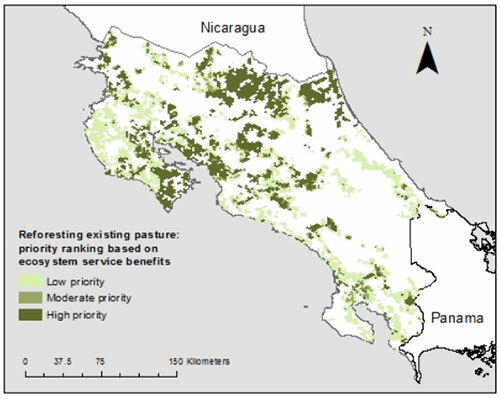 Results of ROOT in Costa Rica showing the highest priority areas for reforesting existing pasture, one of Costa Rica’s landscape restoration opportunities, where darker colors indicate restoration is most likely to improve drinking water quality and reduce sedimentation in reservoirs for municipal water and hydroelectric energy production. The work in Costa Rica was one of the first to integrate biophysical data with socio-economic data in the targeting of restoration and natural resource policy. This integration of social values into ROOT was a key innovation and paved the way for other applications of ROOT, now applied in five countries, including Myanmar, Brazil, Colombia and Malawi. “ROOT will change the game of ecosystem service analysis. It goes beyond weighing priorities and instead delivers optimal solutions,” says Craig Beatty of IUCN’s Global Forest and Climate Change Programme in Washington D.C.
ROOT is free and available to download on the Natural Capital Project website. ROOT’s development as supported by IUCN as part of the KNOWFOR programme, funded by UK Aid from the U.K. government. The Natural Capital Project is a collaboration between the University of Minnesota’s Institute on the Environment, Stanford University, the Nature Conservancy, and World Wildlife Fund.